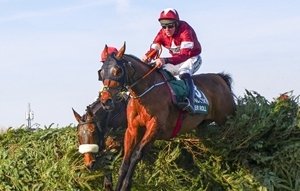 The mighty TIGER ROLL raced into the history books today with a scintillating defence of his Randox Health Grand National Crown for trainer Gordon Elliott and owners Gigginstown House Stud and led a winning double for Goffs UK with IF THE CAP FITS taking the Gr.1 Ryanair Stayers Hurdle. Tiger Roll, who emulated fellow Doncaster graduate Red Rum who won consecutive Grand Nationals in 1973-74, also led home a Goffs Group 1 – 2 in the world’s most famous steeplechase with Magic Of Light running home in second place. Tiger Roll was sold by Darley to Nigel Hawke at the 2013 Doncaster August Sale for £10,000. If The Cap Fits put in a brave performance to take the biggest victory of his career with a late charge to win the Gr.1 Ryanair Stayers Hurdle for trainer Harry Fry and owners Paul & Clare Rooney. The 7YO was purchased by Kevin Ross Bloodstock from Ballincurrig House Stud at the 2015 Doncaster Spring Store Sale for £30,000.